That is, until his and Jane's past reaches out to bring them back into the game - as leaders of a new human colony, to be peopled by settlers from all the major human worlds, for a deep political purpose that will put Perry and Sagan back in the thick of interstellar politics, betrayal, and war. Listen to Old Man's War . I loved this book. 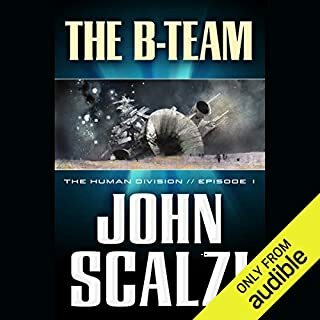 it was an excellent way to tie up the series.I know there is also another book from Zoe's point of view but for the story as a whole i really enjoyed the way Scalzi brought it together.The Last Colony is somewhat diferent that Old Man's War or The Ghost Bigrades...same Scalzi, MUCH less action. If you are expecting big battles (or even a lot of small skirmishes) this is not your book. This book could stand apart fror the Sci Fi genre & be set anywhere in history; I think that is testament to Scalizi's talent!.Once again William Dufris does a wonderful job. I think he really captures the different personalities and tells great story. 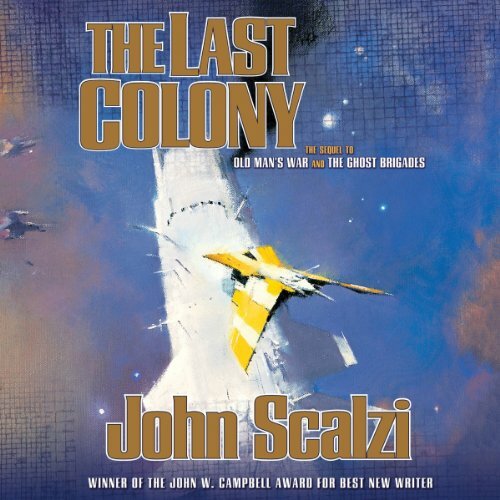 The Last Colony is a step back from The Ghost Brigades, as Scalzi gravitates back toward his more familiar ground of political and legal drama, rather than more traditional sci-fi. There still is plenty of development in the overall narrative of the Old Man's War series, but it feels more like a bridge than cornerstone of the overall story. It is nice to see the setup from the previous novels payoff with a nicely balanced family dynamic with is in keeping with each character's origin story. Each character also gets their moments to shine in the resolution of the primary conflict. This is a solid narrative and enjoyable read. The Last Colony also sets up the future of the series nicely. The tensions building are many and layered from within and without the Colonial Union. Would you listen to The Last Colony again? Why? No, but that does not diminish the fact that this was a very good series. Modern Sci Fi in a Golden Age coat. Great characters, well plotted with big ideas about humanity, relationships and the ability to find truth in a tough universe. I really liked it. John Perry. But I say that with some trepidation. Jane Sagan, Zoe and the rest of the characters were people that I was interested in and to me that is the sign of solid characterization. John Perry here is the character that you came to rely on, both in terms of action, intellect and the emotional arch of the story. I will miss him. I thought he was spectacular. I don't know honestly how he did it. He brought life to the characters and enriched the story. No. I typically listen to Audible in my car and at the gym. But if a book really grabs me I will take it home and listen in my office. This book was one where I just did not want to stop listening. This is true about the entire series. A wonderful story with great characters and a clever plot. This book has gotten good reviews. I agree with them and highly recommend The Old Man's War Series Books 1-3. Fundamentally however this is classic space opera with some conventional plot devices. So if you are into classic Sci Fi, I think you will very much like it. I am glad I finally got around to it on my Wish List. "The Last Colony" is not up to the level of its predecessors, which were some of the better science fiction I've read, but a great fun read (listen) still. 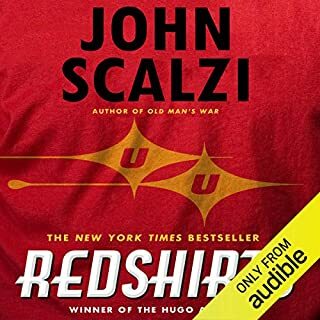 The action was fast paced, the touch of humor, characteristic of Scalzi, excellent and not overpowering, just integral to the appropriate characters. The narrator did a great job adding individuality and personality to characters, but i wish at least 50% of "he said' and "she said" was edited out. Isn't that the point of using different voices for characters - to reduce unnecessary annotations? Also words 'colony' or 'colonist/s' are in almost every sentence, which is a little jarring, i imagine synonymous words could be used every once in a while. While carousing a book store I came upon the first book in this series 'Old Mans War'.. I opened it to the first line: "I did two things on my seventy-fifth birthday. I visited my wife’s grave. Then I joined the army." This was not normally in my genre but I couldn't put it down after that. The series, as well as this book, has been thoroughly entertaining. John Perry of course. You identify with him quickly. I don't spend my energy wondering why John did this or that. But to be honest, it really isn't just about John in this book. He blends several stories and characters well. I do feel that the end of this story should have included John getting the same enhancements as his wife. Talk about unequal footing. 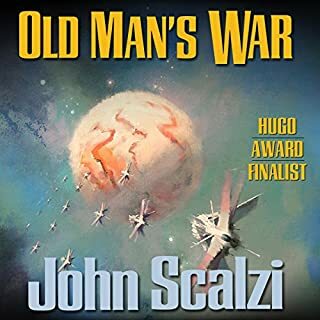 The Last Colony, the third book in John Scalzi’s OLD MAN’S WAR series, returns us to the perspective of John Perry, the “old man” hero of the first novel in the series, Old Man’s War. John Perry is only mentioned in the second novel, The Ghost Brigades, which told the story of how the cyborg Special Forces soldiers found and defeated the scientist Charles Boutin, a traitor to the Colonial Union. On that mission they also found Zoe, Boutin’s young daughter. 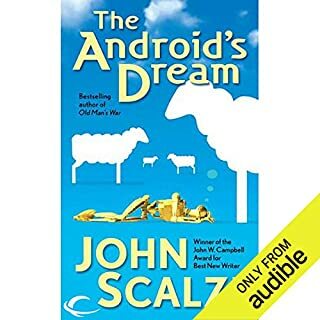 Zoe has been adopted by Jane Sagan and John Perry and the little family has been farming on one of Earth’s colonies where John and Jane are the leaders. Life is easy for them until the Colonial Union comes calling — they need leaders for a new colonization effort and John and Jane have been selected. This new colony (named Roanoke…. hmmmm… I think I wouldn’t have signed up for that) will be comprised of people from several different human worlds and John and Jane are responsible for its success. However, the Colonial Union hasn’t been completely honest with them. It will be a lot more dangerous than the members of Roanoke have been led to believe. They are being played as political pawns and they don’t realize it until it’s too late. And it’s not just Roanoke that’s in danger, but the entire human race. The Last Colony (I keep wanting to write “The Lost Colony”) has a different tone than Old Man’s War and The Ghost Brigades. It takes place mainly on a planet, rather than in space, and deals mostly with domestic and political matters rather than space battles and espionage. Some of the political dialogue between characters we don’t know is dull, especially if you’re hoping for lasers and explosions, but Scalzi continues to explore the interesting theme of access to information and the problems that occur when the government controls the press. When and how should governments control information? That’s always a relevant topic, isn’t it? 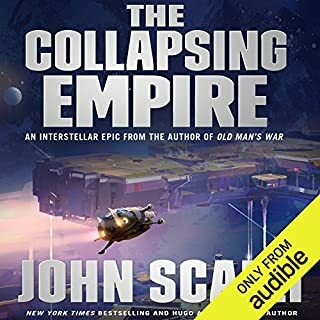 Like its predecessors, The Last Colony features John Scalzi’s engaging writing style and ultra-competent well-developed characters. Some of these are characters we already know and love (John and Jane) one is a character we are happy we’re getting to know (Zoe) and some are new characters that Scalzi makes it easy for us to love (e.g., the Mennonite leader, Hickory and Dickory) or hate (e.g., the journalists). And some are there to show us that our first impressions aren’t always correct. I mentioned in my review of The Ghost Brigades that the political situation was getting murky and it gets even murkier here. It is not clear to us (or to many of the characters) whose side we should be on. Readers may find it discomfiting to realize they are having trouble sympathizing with their home planet. It may be even more discomfiting to realize that Scalzi’s story doesn’t have to stretch the imagination too far. Sometimes “human nature” is not a pretty thing, but it’s what we know. What if someday we find ourselves needing to interact with beings who have a non-human nature? You can probably read The Last Colony without having read the previous books, Old Man’s War and The Ghost Brigades, but you’ll have some catching up to do. It would be better to wait on this one until you’ve read its predecessors. They’re both great books, anyway. The fourth book in the OLD MAN’S WAR series is Zoe’s Tale which tells the story of Roanoke colony from Zoe’s perspective. It’s mostly the exact same plot as The Last Colony with a few side adventures for Zoe. If you’re only interested in the plot progression, you can skip Zoe’s Tale. If you’re interested in getting to know Zoe, you should read it. I’m listening to William Dufris narrate OLD MAN’S WAR. I think he’s amazing. Macmillan Audio produced this installment. Nice pivot in this third book away from the mostly military point of view, and toward the life of colonists. Of course, with John Perry and Jane Sagan, there are military intrigues and strategy to divine, but seeing them both settled and happy (about eight years out of the CDF) is a nice change of pace and gives them both fuller life. The book itself moves quickly, with some familiar characters returning and new characters (and species) introduced, more layers of the workings of the galaxy uncovered, and momentous decisions to be made. The book ends with some aspects enjoying closure, but a major cliffhanger (in the best sense). Curious where the series will end up, but Scalzi always makes the reader's journey enjoyable. Book 3 of the Old Man's War series unites the main characters from the first 2 books, John Perry and Jane Sagan, and jumps ahead to their retirement on the peaceful colony of Huckleberry. Of course their relaxed existence is disrupted as interstellar politics and conspiracies take over and they find themselves facing one impossible challenge after another. The Conclave plot line picks up steam and the stakes get ever larger as the story goes on. 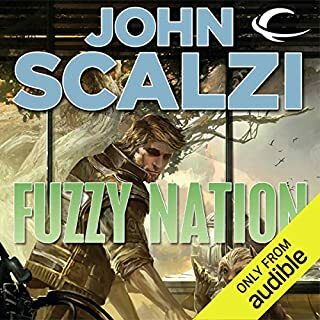 All of this makes for an interesting enough premise but in the end Scalzi's execution and Dufris' narration just didn't keep me immersed this time around. A myriad of small plot devices add up as the book goes on and very few of the characters act realistically. John and Jane uncover clues that things are amiss but just go along for the ride putting themselves and their adopted daughter Zoe at great risk. The aliens speak using standard 21st century colloquialisms and General Gau, the Leader of the 420 alien race Conclave, puts himself at risk to personally visit colony planets to speak with the leaders before destroying them. The list goes on throughout the book and the final plot twist at the end was the least believable of the bunch. I didn't dislike this book but it did leave me uninspired to immediately continue with the series. When I do resume it will likely be with book 5 and not book 4, Zoe's Tale, which is a re-telling of the story from Zoe's perspective. Although the story was ultimately entertaining, once was enough for me. The Old Man's war series just keeps getting better. The narration in this series is superb! Can't wait for the next one. What made the experience of listening to The Last Colony the most enjoyable? Perry is a heroic figure. Hi wife, Jane, and daughter, Zoe , star in this audio book. What was one of the most memorable moments of The Last Colony? don't miss this book if you are into the OMW series.